Jose Valenzuela was in Superior Court Monday for a pretrial hearing on murder charges in the deaths of Michael and Tina Careccia. 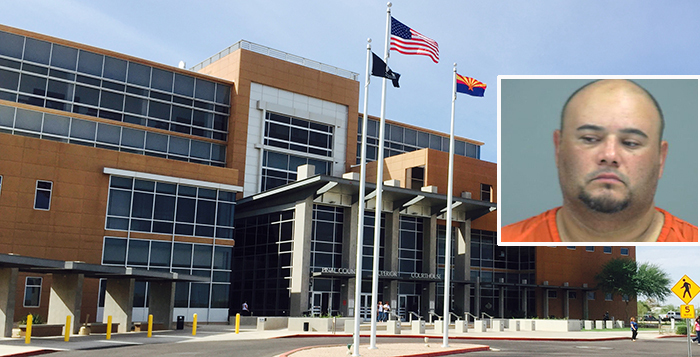 The man accused of murdering a Maricopa couple was in court Monday asking for an extension. Jose Valenzuela Jr. is charged with first-degree murder in the deaths of Michael and Tina Careccia. Family and friends of the Careccias filled two benches in the courtroom in Florence. They were silent as Valenzuela was brought in wearing red PCSO garb. He also remained silent during the pretrial hearing. With no objection from the County Attorney’s Office, White granted the extension, with the next court date set for Oct. 5. Afterward, Mannato said the nature of the evidence he was talking about was fingerprinting, ballistics, tire tread and toxicology. The family has refuted Valenzuela’s claim that the Careccias were using meth, so the results of the toxicology report are of primary interest to the prosecution and the defense. Mannato said the defense will look at the forensic evidence coming forward to see if it conflicts with information given to the grand jury. The Pinal County Sheriff’s Office has charged Valenzuela with shooting the couple to death on Father’s Day. Their bodies were found buried in a six-foot grave on the Valenzuela property on Papago Road south of Maricopa. Valenzuela pleaded not guilty at his arraignment in July.